Hello! I can’t believe we’re halfway through December already. Only two more Wednesdays left, and then it will be 2011. Here is this week’s Hump Day Happies. 1. I don’t know what it is with me and leafy-type things (and dishes), but I love these pine tree ceramic plates and this matching mug. So cute! 2. 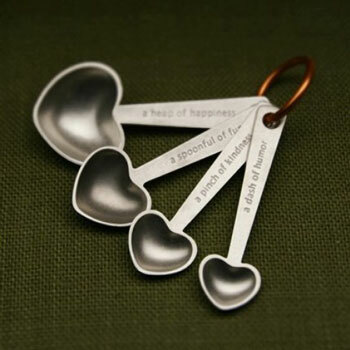 These quotes measuring spoons are so cute. Hearts and kitchenware, <3. 3. This room. 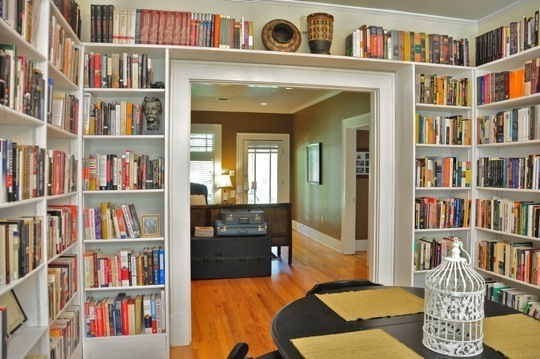 I would love to have a room like this, filled with books. 4. 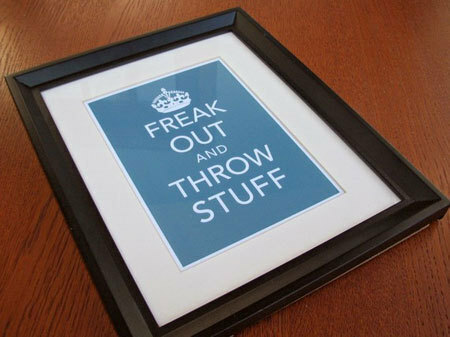 These “Keep Calm and Carry On” parodies, seen here. My favorite is the one pictured above. 5. 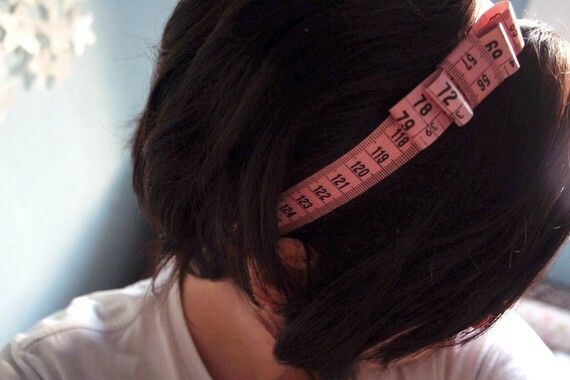 This measuring tape headband. How cute is this? Now I just have to learn how to sew before I think about wearing one so that I don’t look like a poser, lol. 6. I’m a sucker for puns, and this one is no exception. 7. I love wedding blogs, so I see tons of wedding pictures everyday. 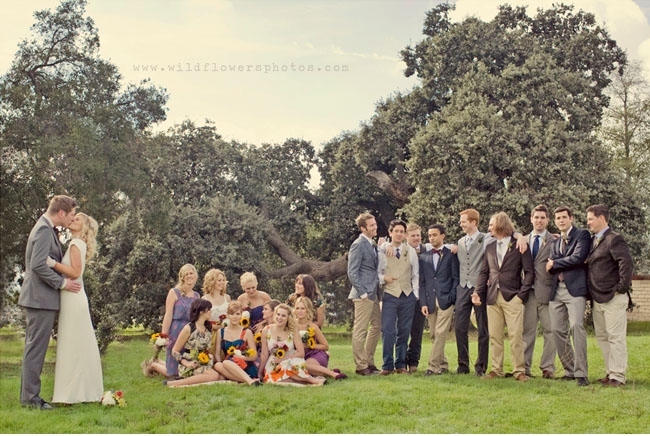 I usually like it when wedding parties match, but I was pleasantly surprised by how much I liked this wedding, along with their mismatched wedding party picture. 8. 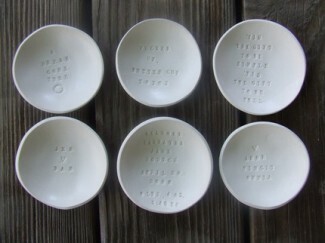 These custom tiny text bowls. You can put whatever kind of text you want, and I love the matte finish. 9. Lea Michele. I think she’s so cool, and I love these two pictures. 10. Christmas, Coca-Cola, and snow globes. Wonderful. whoa. only 2 more Wednesdays left!? only 9 days til Christmas! 3. that's the dream. sigh. 4. lol it would be wonderful to have them framed side by side. oh and i also like when the crown is upside down. 5. omgoodness! this would be so great if you dressed up like cinderella for halloween. 6. hahaha oh how i like fonts. and puns. 7. aw it's like the picture tells a story. like. & maybe you like it bc of the sunflowers. 8. aw i like these too. 9. i like the first one so much! 10. lol such a wonderful combination! i love when the dog slides into the house. 8.i wish i could read them! they are so cute!